Excellent quality rim cement for gluing tubular tires in a resealable 250g can. I have only used the Mastik One cement, so my experience is limited. That being said I found the curing time to be very forgiving. Example I applied too much glue around the value stem and after a 2 day dry time and a 70 mile ride ( where I figured out I had applied to much glue due to a hop in the tire) I was able to remove the tire and remove the excess glue. Did a century the following day with no hop. I've been riding tubulars exclusively for over 30 years. I've used about every glue there is and Vittoria is by far the best. Using the can makes it even easier to apply. don't use any other kind. 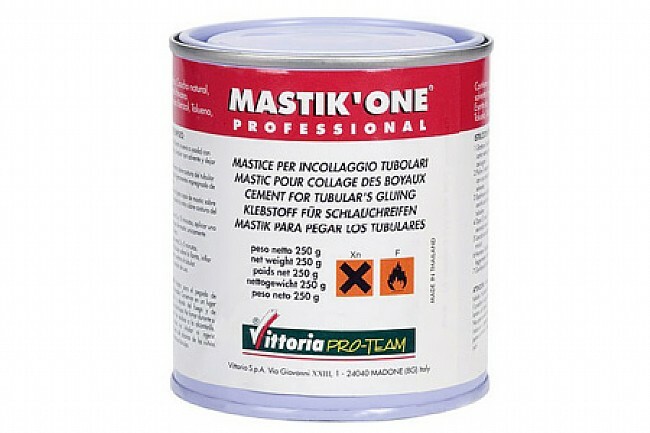 Mastik One is generally regarded as the best tubular glue on the market. I've never had any issues with it. I prefer the can because it's a much better value than the tube. Keep the rim as clean as possible and it will seal completely and last indefinitely on the shelf. Hands down the best tubular glue I have used. I glue a lot of cross tyres and have had no problems. Granted there's many techniques out there but in order to have those techniques work you have to start with the best glue, this is it. Use it. Old school is sometimes the ONLY school! I had two sets of wheels to get ready for racing. On one I goofed around with a plastic ucky glue compound that got all over, it was horrible! I got the Vittoria mastik, like in the little tubes years ago, and it was smooth as butter to put on, didn't good or leak all over the place and the wheels I did with this product came out perfect. I have to redo the others now and strip off the gunk before I can use this cement on them. The one and only bad thing is that there were wisps of strings of mastic I found would go from the rim and brush and fall on a surface, sort of like a spider web. Not a big deal though, they wiped right off. Bought this to glue up some Clement MXPs as my first tire gluing attempt ever. While I have nothing to compare to, this and CX tape have held the tires solidly for a handful of races and some test and training rides. It was pretty clean relative to the horror stories I was told about gluing and will be using it again. The benchmark for tubular cement around the world. Nothing else is as good. I use this product to mount Tubulars on carbon rims. Although, the gluing process takes time,the Vittoria Mastik works great. It has the right amount of solvent in the mix to brush on smoothly. and the tack is excellent allowing some movement when mounting the tire. Once cured,the tire is on,I feel confident that It won't roll off. tubes,the can is the way to go if you glue alot.